I was looking at different dessert recipes when my cousin sent me one for a Venezuelan bienmesabe, a coconut custard cake that required me to crack one open and extract the milk. Picturing hammers and machetes and emergency room visits, I thought she was crazy if she thought I was going milk my own coconut. My next thought was where in New York to find them. In Miami this would not be a problem. Though Miami Beach has become unrecognizable in many ways, you still see men pushing grocery carts of fresh green coconuts along red hot sidewalks. With one balletic move, they’ll swing a giant machete to cut a tiny hole just big enough for a slender straw for a coco frio. Fresh or dry, I knew my best chance was Essex Market in the Lower East Side. I found them straightaway at Batista Grocery. The clerk helped me pick out a few by shaking them to make sure they had water inside and offered to crack them open for me to be sure that the meat inside was still fresh. For a moment, I was tempted. It would be so much easier, but I was decided and it seemed a shame not to go through with it. After all, it was a pretty common kitchen technique before we were all hooked on cans. 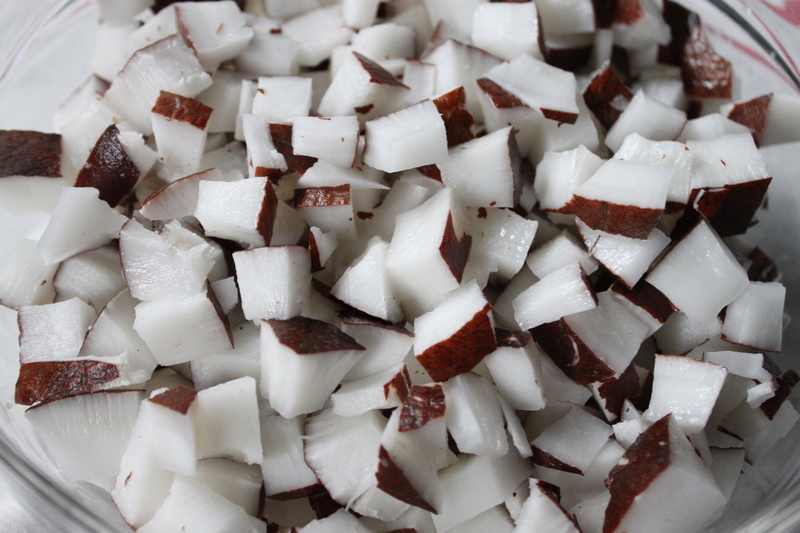 So here are some pictures along with a few things I learned by milking my own coconut…1. The people at Batista Grocery care about selling you good produce. Not only do they always humor my nervous questions, but while I was being rung up, the woman at the register checked over what I was taking and switched one out for me (it was the only one I’d picked out by myself). 2. 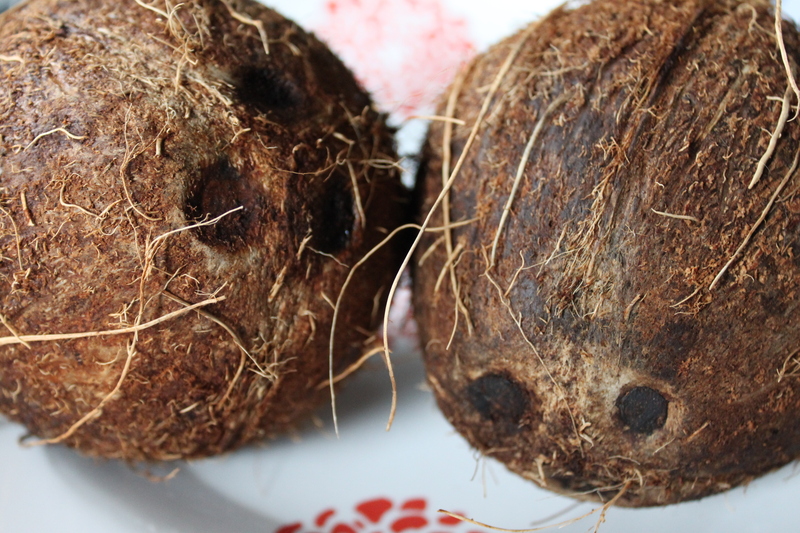 Coconuts have three little black eyes on one the top that should be dry and free of mold. The holes can be punctured with a corkscrew then drained. 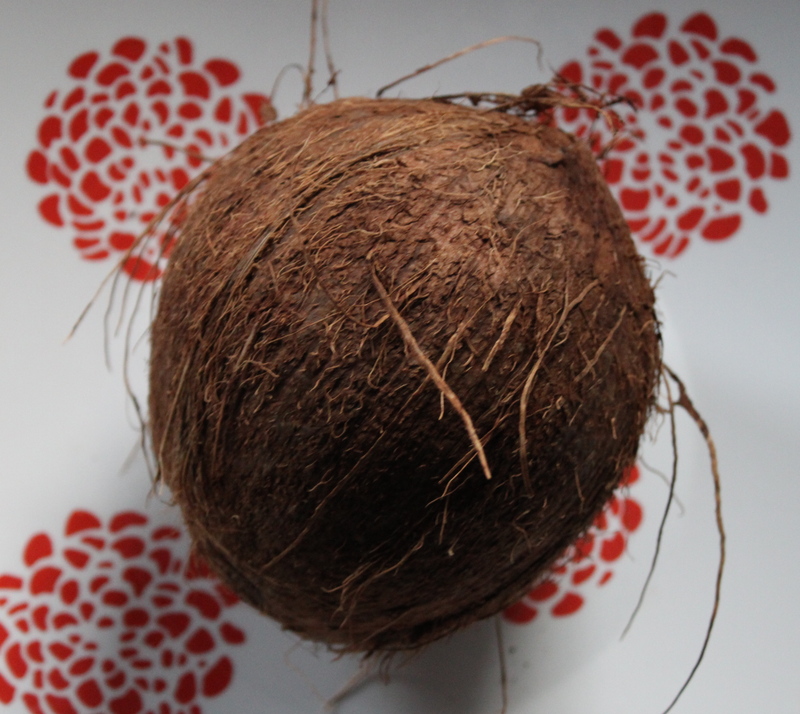 When punctured, the coconut made the same “ahhhhhh” sound as a can of soda. 3. 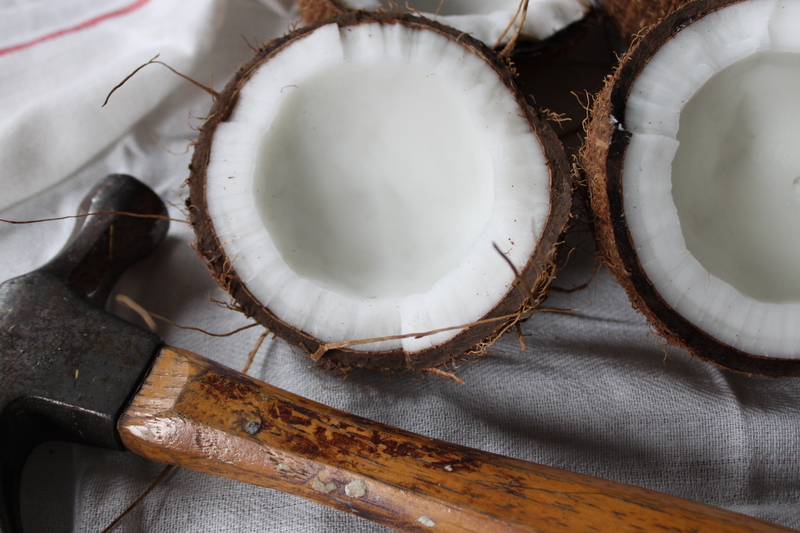 To crack open the drained coconut, a few hard taps of with the blunt side of a heavy knife where the coconut is widest may be more ladylike, but a hammer works faster. I had beginner’s luck with my first coconut. After a few taps, I saw a perfectly straight fissure open up along its center. The next three didn’t budge. After a quick Howcast check, I heated the other three in an oven at 400 degrees for 10 minutes. Once cooled, they opened easily with a few hammer taps. Though most sites advice using a sharp knife, I used a strong butter knife, that didn’t bend, to pry the meat away from the shell in larger pieces, making it easier to peel the skin away afterward. 4. 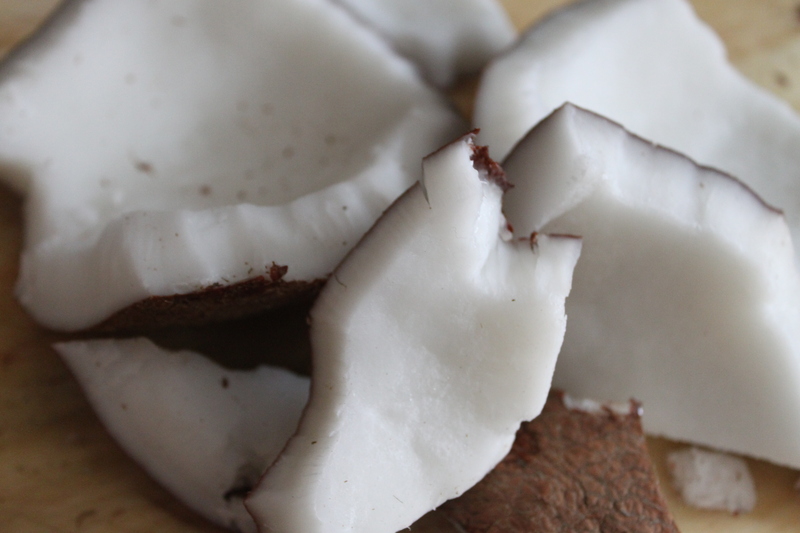 Grating coconuts was time consuming, but my hands have never been so soft and my kitchen smelled wonderful. 5. 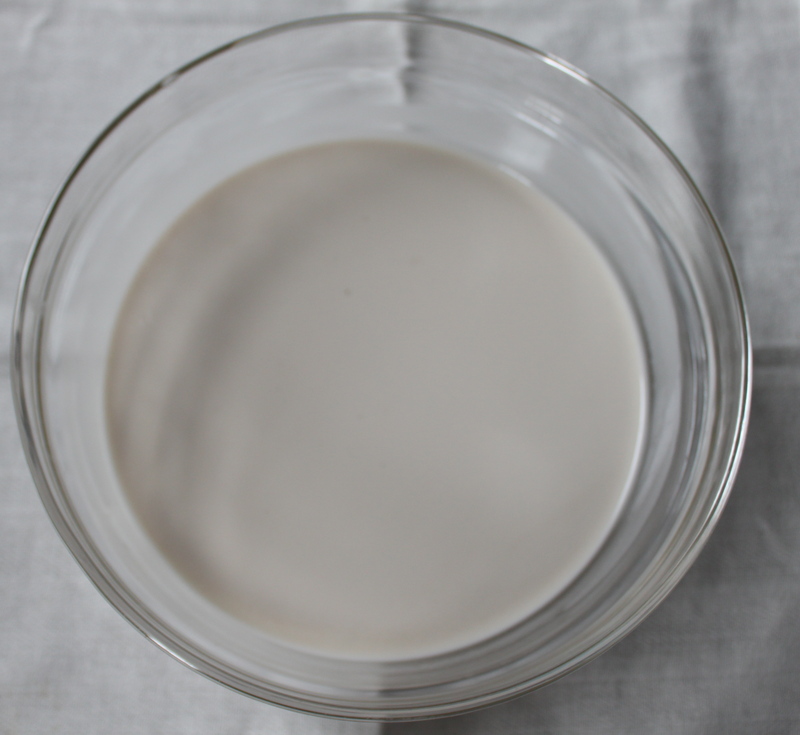 I blended 6 cups of shredded coconut with 2 cups of very hot water, then passed them through cheesecloth into a fine mesh strainer to produce about 3 to 3 1/2 cups of fresh coconut milk. Though it seemed like too little at first, there was always more to wring out. 6. With all the tapping and draining and shell specks flying it was easy think I was doing it wrong. In the end the coconut gave me what I needed, a perfect liquid moon. Thanks for the info, I never knew how to open a coconut properly.